We understand that a first-time visit can be awkward. We hope that the information here will help make you feel a bit more comfortable. If there is anything else you'd like to know before you visit, please don't hesitate to call the church office at 207-872-7564. Our friendly staff will be happy to answer your questions. We are located at 61 Pleasant Street in Waterville. We invite you to come as you are. There is no dress code, and you will find people wearing everything from jeans and t-shirts to suits and ties. There is a "Welcome Table" in the upper level of the lobby where you can help yourself to informational brochures about the church, current studies, small groups, etc. Our building is pretty large, so if you're having any trouble finding your way around please ask for directions. We're happy to help. Sunday school for all ages is during the 10:30 worship services (Labor Day to Father's Day). You can find out more about our Sunday School programs by clicking on this link. Parking is available in the lot next to the church, and there are designated handicap spots next to the food bank. If you are transporting someone with limited mobility or if the weather is inclement, feel free to use the drive-through portico for drop-offs. 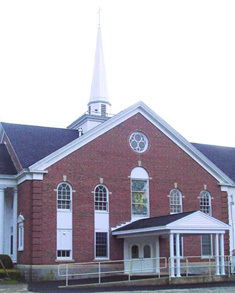 Pleasant Street United Methodist Church is fully wheelchair accessible. Enter the building through the double doors under the portico. The church office is immediately to your right. (Office hours are Monday through Thursday 9 AM to 2:30 PM.) The sanctuary is located directly ahead. The chapel is located on the second floor. To get to the chapel, you can use the elevator in the upper lobby or the stairwell to the left of the elevator. A greeter will welcome you at the door of the chapel for the early service, which is held at 8:30 AM. 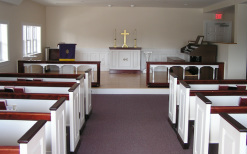 The chapel service is an abbreviated, traditional style service that lasts about half an hour. The space is more intimate than the sanctuary and seats about 35 people. Communion is celebrated on the first Sunday of the month and all are welcome to participate, regardless of religious affiliation. We serve grape juice in place of wine, and a gluten-free alternative to the bread is available - just let your Communion server know you'd prefer it. Our later service begins at 10:30 AM (Only one service at 9:30 AM from Father's Day to Labor Day) in the sanctuary on the first floor. Greeters will welcome you at the door and are happy to answer questions or help you find your way. Ushers are stationed at the sanctuary entrance to help you find hearing assistance devices, large print hymnals and bulletins, children's activity sheets, and to help with any other need you may have. Parishioners will greet you warmly and offer you a gift bag, but we'll try not to embarrass you! We never ask folks to stand up and identify themselves as newcomers. This inter-generational service generally lasts between 60 and 90 minutes. The style is a blend of traditional and contemporary worship and includes time for a children's message. The adult and youth choirs participate from September to June, and a variety of individuals provide special music during the summer. We use a media projector to display prayers and hymns, as well as to illustrate the sermon and highlight various church ministries. Communion is celebrated on the first Sunday of the month and the table is open to all persons. We serve grape juice in place of wine, and a gluten-free alternative to the bread is available - just let your Communion server know that you'd prefer it. We hope you'll stay and join us in the fellowship hall for refreshments and conversation immediately following the service.